Happy St. Patrick's Day! When Andi & Heather asked me to participate in green week with them, it was an easy yes for me. I've mentioned it a hundred time before, but I'm obsessed with the color green. Turns out I have quite a few outfits featuring green in my archives. 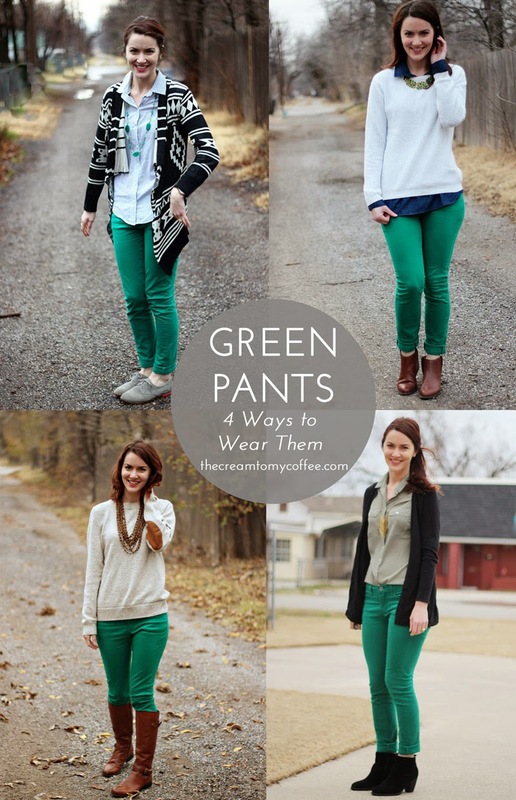 So to kick the week off, I thought I would show you four ways that I have worn my green jeans! I picked my pair up from JCPenney a few years ago, but I did a little round up of some affordable options below, if you're interested. I found this sweater in my husband's closet and I haven't stopped wearing it since. I love the elbow patches, and all the brown works really well with the green. Also, this picture is kind of making me want to chop my hair off. It's hard to tell, but the button-down I am wearing has a really subtle pinstripe, which is why I thought it was fun with the printed cardigan. I do feel it necessary to acknowledge the strange movements my hands are making... Not sure what is happening there. I wore a version of this exact outfit all winter long. Sweater over a collared shirt, skinny jeans, booties - you really can't go wrong. I wanted to try something a little different and make a pretty overt "St. Patrick's Day" statement. So this is what I am wearing today. The olive is pretty subtle and the black balances all the green out... at least that's what I told myself when I put it on this morning. All the link up info is after the break! On to the link up! It will be open all week, so dig through your closet to find some green and join us. 1. Please follow Ashley, Heather, and Andi via Bloglovin or GFC. 3. (Optional, but nice) Include a link back to us in your post, letting others know about the link-up. I love all the ways you've worn these! Especially with your husband's sweater! I wish I could borrow from my husband, but he's way too tall! All four of these looks are fantastic! And I really think the green and olive in your outfit for today totally works together. This is SUCH a helpful post!! I only own three green items, one of which I just wore for the first time on today's blog post. Can you guess what it is? Green pants! They are a dressier ankle pant but I love them! This post will be great for inspiration the next time I wear them. Going on my Pinterest boards! I love all of these! I have some green pants that I got from Old Navy a while ago, but I haven't worn them in a while! I totally should have worn them today! I really like ALL of these looks! Definitely the style I enjoy, but I can never really pull off ha. Love it! All of these are great! As you have proven green jeans rock and are so versatile. Out of all my colored jeans, my green ones top the list with red right behind them. So excited to be co-hosting with you this week! I am just now realizing that I do not own a pair of green pants! This is a travesty! I love all four looks, but I think my favorite is the third! Love all the green. That last outfit is really pretty. Love how the black balances it all. Love all the fun green! I can't decide which outfit is my favorite - they're all so cute! All 4 looks are cute! The layered look is my fav. :-) I just thrifted a pair of green jeans this weekend and I can't wait to style it. All the green pant looks are fab! No virtual pinching for you ! Loveee these looks! Now I need green pants ASAP! I love all these looks, but great idea to pair the brighter green with olive - I wouldn't have thought of that! I love all of these! The printed sweater one is my favourite :-) This year was the first St. Patricks day that I've actually had green to wear, and I loved it! I definitely love that bulky sweater and knee-high boots combination!! All these looks are so fantastic! I don't have green pants, but can easily substitute my purple/fuschia ones and it would work with the tops you styled! Fantastic! A big yes to all of these! I meant to say this the other day when I was over here: thank you thank you for your always sweet comments on my blog! I love reading them and I really love following along with you as well. You put a really positive spin on what you write which is so nice to read! I'm hoping I can participate in green week! Always lots going on. At the very least, I can wear my mint green pants in honor of the occasion, especially now that I have all these great ideas for styling them! All cute- but I think I love the one with your hubby's sweater the best. I'm glad you made use of that- it is perfect!! I honestly never thought that green pants could look so chic! I'm happy to admit that you've changed my mind. The 'bulky sweater' and 'layers' outfits are my favorites. They look absolutely comfy and perfect for the winter mess that is currently ongoing! All great styles! Thanks so much for stopping by EPWL! I really all of the 4 ways, but the bulky sweater is my favorite! Great post! Thanks for checking out my blog! love all these fun green looks!!! those elbow patches on the first look are so cute! I can't believe how much fun I have styling my green jeans... I love all these looks! Visiting from the SITS Link up! I love your blog! So glad I found you! Ashley, I LOVE the outfit with you in the sweater with elbow patches! Oh my gosh - it is so cute! 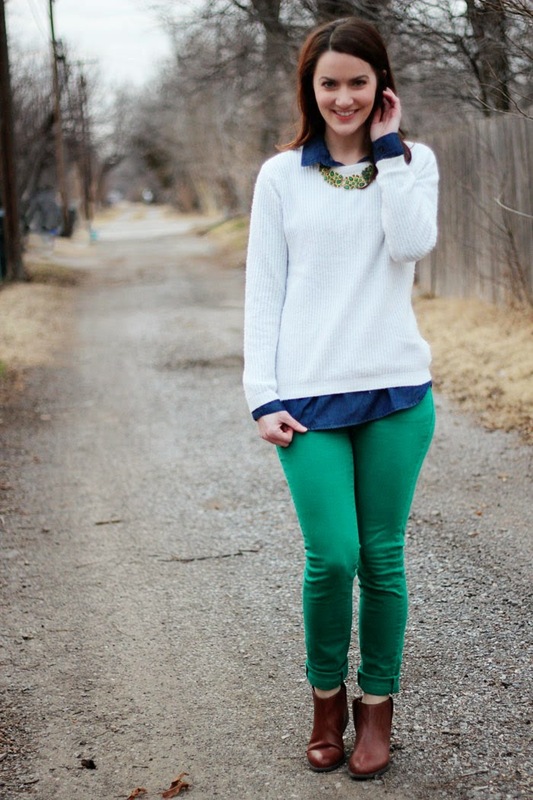 You look relaxed and comfortable, but the green jeans stand out in the best way!